Do you think you need a “job” to make money? The fact is, the job market we rely on to make that money is not looking that great. A struggling economy has lead to a severe lack of jobs. Although the job market as a whole is doing much better – we went from an unemployment rate of 9.5% in 2007 to just under 5% in 2017 – there are still tens of thousands of us who can’t get a job. People who enjoyed relative security throughout their lives now find themselves in a tough spot where they can’t even afford to pay their monthly bills. It doesn’t look much better for the people who are just getting into the workforce (students, high school drop outs, college grads, etc) either. But somehow, many of the same people manage to stay afloat without a traditional job. Sure, some are digging into their savings. Some have friends and family to support them. But there are also many who are actually making a living without a 9 to 5 job. Most of the opportunities these folks are using to make a living from wouldn’t even exist without the internet and what it has made possible – like the sharing economy. There is money to be made, even if you don’t have a job. For some, it won’t quite match their old salary and what they used to make, or are still making at their day job. For others, the money they make could be way more than what they could have ever dreamed of. Can YOU make enough money to pay your bills without a job? The answer depends on many factors. But if we are asking whether it’s actually possible or not, the answer is a definite YES. There are hundreds of thousands of people who are making a comfortable living online – eCommerce site owners, Bloggers, Freelancers, Affiliate Marketers, Entrepreneurs…. Obviously, not everyone is going to be able to make a living, nor is everyone trying to. For a lot of people, the goal is to make a little extra money. The good news is that no matter which group you belong to, there are many opportunities for you to try. Now the amount of money you can make on the internet (or with opportunities that are available as a direct result of the internet) is only limited by what you can do, how familiar you are with doing it, and whether or not you’re comfortable promoting yourself and what you do. For example, there are bloggers who are making 7 figures, so you can imagine that the bar is set quite high in terms of what is possible. On the flip side, there are people working on the internet who are making a few dollars a day. There are also tons of people in between, making a few hundred dollars a month. Disparities in income are the same on the internet as they are in real life – it’s a matter of supply and demand. Before we begin, please remember that we made this list with a wide variety of people in mind. It is incredibly unlikely that every option on this list will be a good fit for you. That’s why we compiled a very large list so everyone can find a few options that may interest them. Feel free to try as many of these opportunities as you like. But don’t spread yourself too thin. Pick a few and put all your efforts behind them so you can get results. Don’t get bugged down with the shiny object syndrome. That is one reason why so many people fail to make money online. They keep jumping from one thing to another without ever giving one 100%. They then conclude that this is all a myth and that making money online nothing but scam. 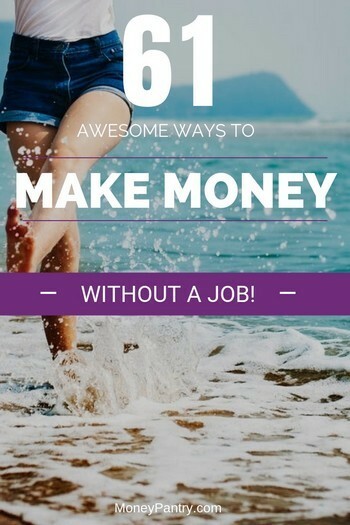 We are going to list a lot of great ways that you can make money without working a traditional job. We are going to start with online opportunities, then we’ll cover options for making money without a job, offline. It doesn’t require any experience or investment. It’s totally free to join any legit survey site. These sites conduct online surveys on behalf of companies and manufacturers who use the feedback you provide to improve or develop new products. In return for your time and input, you are rewarded with cash, gift cards, and other prizes. It’s not unheard of to make a few hundred dollars a month with surveys. The way to do that is by joining a few dozen legit panels so you can have access to a lot of paid survey opportunities. Yes, you can get free money from the hundreds and thousands of class action lawsuits that are brought on companies every year. But how do you find these lawsuits, and what if you don’t even have a proof that you have used the said company’s product or service which qualifies you for the settlement? Good news is that there are sites out there dedicated to listing all the class action lawsuits that are still open. And the better news is that many of these cases don’t require a proof of purchase. For example, if you have ever drank RedBull, you get up to $15 through a class action lawsuit brought on the company because of their slogan “RedBull Gives You Wings”. I have personally done this many times. The beauty of this method is that most of us already have lots of books that we no longer need or use. Selling them can be a great sources of extra income. And if you want to take a step further, you could hit your local thrift shops, buy used books for pennies, then sell them for $5, $10, and even up to $100 or more depending on the book. What makes this process even easier is the existence of sites and apps like BookScouter. Simply install their app, then scan any book’s ISBN with it, you will instantly be given the highest prices you can sell that book for online. BookScouter searches over 40 buy-back-book sites to find you the highest price. User testing is a real thing! In order to test the functionality and user-friendliness of their website, many businesses pay people to simply visit their site and test the various functionalities of it. Of course finding clients on your own is almost impossible, which is why sites like Usertesting are there. You can sign up for free, then whenever they have a new site to be tested, you will be notified. You visit the said site, then report back with your experience. The pay differs from site to site, but Usertesting pays $10 flat for every site review you complete. There are websites that conduct mock trials on behalf of their clients, which are mostly lawyers. These lawyers want to know how their case might go when they are in the actual courtroom facing the judge and the jury. So, to get a sense for it, and adjust their strategy accordingly, they use mock trial sites to present their case in front of an online jury. You can get paid to become a jury in such trials. Think of it like writing articles for a newspaper that you’re the sole proprietor of. Believe it or not, blogging is actually a very strong opportunity for making money, as we mentioned up above regarding the top bloggers. In the past, the primary obstacle for hosting a blog would have been obtaining a domain to host the blog, but now there are platforms dedicated solely to blogging, like WordPress, which make it easier than ever to get into the game and start a money-making blog in no time. Blogging is a great investment in terms of time and money because an article you wrote for 4 hours will be up and available for viewing for as long as your site lives. Furthermore, it requires essentially no money to keep going but has the potential to make you plenty of money. There is too much to say about blogging to fit into this article, but if you like the sound of it, definitely do some searches and read up on it. Even if you’re not comfortable with the idea of running a blog, you can still get paid to write for someone else’s. Note: These are free blagging platforms that allow you to build a site quickly and for free. Start with these, get a feel for how this whole blogging thing works, then you can move on and buy your own domain name and hosting. At that point, I would suggest you build your blog using WordPress (this is the .org version of it which is for self-hosted sites). If you’re not familiar with affiliate marketing, it means that you’ll advertise something in return for a commission on the sales. This is essentially a sales job that can be done by the introverted and the extroverted alike, since it doesn’t require that you actually interface with people on a personal basis. Affiliate marketing is usually a way that people prefer to advertise their product because it feels more organic, and people are more likely to purchase something that they don’t feel has been explicitly advertised to them. Affiliate marketing is usually tied to blogging, as a blog is an ideal place to do something like write a review of a product and provide a link to the product at the end. Some affiliate marketers are paid simply to drive traffic and don’t need to make sales, but as a rule of thumb, you should be trying to drive sales in the least “advertisey” way possible. Working as a virtual assistant, explained simply, is like being a secretary from your house. A variety of people will be wanting assistance for whatever they do, whether they write research articles or run an online business, and that’s where you come in as a virtual assistant. You should expect to be doing administrative work as a virtual assistant, so be prepared to employ skills like email response, data entry, examination of facts and organization of information. It’s as simple as being, well, of assistance to your employer, but you’ll almost definitely need some customer service skills. Keep that in mind if you’d prefer a more “back of the house” position. Despite the fancy name, telecommuting is as simple as it comes. A telecommuter is simply someone who does what would be done in a normal office job, but they do it from home. It can be in a variety of industries, advertising or administration or anything else. What jobs can be done via telecommuting are more about what companies are offering telecommuting jobs than about what can be done at a distance. In the internet age, virtually every job can be done from home. Whether you’re coding software, coming up with advertising, if you’re an artist or a writer or a manager, it can likely be done from home. Even board meetings can be done via communications software like Skype. Do a quick Google search for Telecommuting jobs and you’re sure to find some websites that will help you get going. Personally, I still can’t believe how easy this option is. There are a wealth of websites that are dedicated to t-shirt design, which is an emerging internet industry. Then you can use their design interface to design a T-shirt. It’ll have a variety of options, like choosing the cut of the shirt (crew, women’s, v-neck, etc,) choosing a font, font size, font color, shirt color. You can usually take images from your computer and put them on the shirt, and you can usually design a front and a back for the shirt. Different companies have different limitations for what you can and can’t do. Either way, when you’re finished designing the shirt you’ll set a sales goal and a sales price, both of which will affect how much the company will pay you per shirt sold. Then you go out, and advertise the shirt and try to get people to buy it. If you reach your sales goal, the shirts will be printed, distributed, and you will be paid for your work. It costs NOTHING to design the shirts; the companies make enough money from the sales to pay you for the work and still keep a tidy profit. The only obstacle is the actual advertising and sales. Past that, it’s all profit for little work. So, if you’ve got the skills to drive purchases and advertise in an unobtrusive way, you should seriously check this out. Fiverr is a service where you offer your skill for a flat rate of $5. This is a good option, but only if you have a skill that you are capable of doing in mass. You might want to consider doing this if you’re trying to build a portfolio for something so that you can move up eventually and charge more for your services. For those in western countries, the income from Fiverr might not be quite enough. But if you live somewhere with a lower cost of living, and you can do a high volume of business, then the money from this site can add up to something pretty significant. Are you someone with a high level of knowledge about a certain topic? There are a variety of websites that are willing to pay you for your expertise. The general format is that a question will be posed to an expert, and you’ll provide your answer. If the asker approves your answer, they’ll pay out, and the site will give you your cut after intermediary fees. You could be looking at making $10-$20 per accepted answer, so the money can definitely add up. However, they’re pretty serious about the idea of an “expert.” So you’re going to need to go through an application process to join their ranks, and they might require details like thorough work history, college degrees, etc. But if you’re capable of providing proof of expertise, this is a great way to make some side money. As you might imagine, being a writer is a dream job for many people. 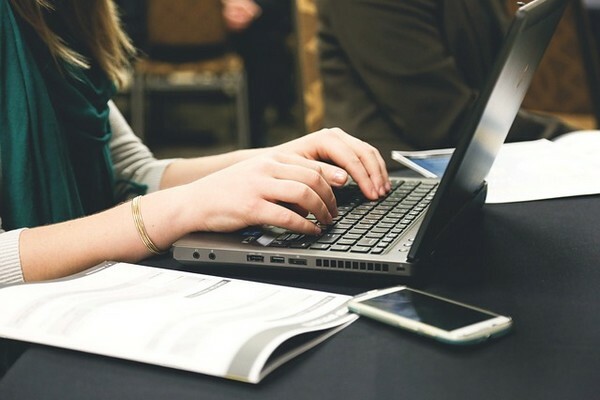 The internet provides a lot of opportunities to be a paid writer, and a portion of those people are able to rise to prominence and make a solid living from the profession. But even if not, you can almost definitely make good side-money for being a writer. This is related to blogging, but not strictly limited to it. Writers can get paid for any type of writing, but sites like WritersDomain will often offer you a topic and a price and ask you to write an article with a certain word limit. Sites like that are a good way to get started, but if you’re looking to get more serious about writing, you should pursue a more long-term situation by finding clients through a site like oDesk or eLance. It is recommended for anyone looking to be a full-time writer to manage multiple types of writing, like writing for clients, writing for a blog, and potentially using their writing skills to pursue affiliate marketing. Although micro freelancing is a form of freelancing, I wanted to give it its own section since it has been growing tremendously in the last few years. The main difference here is that tasks are normally very small and easy to complete. Accordingly, the pay, of course, is lower as well. People who are starting new forums online often need a way to build the notoriety of their website, and one way of doing this is to hire people to make quality posts on their forums to draw attention to them. A good hub for this type of work is the aptly-named paidforumposting.com, who employ a select number of writers who are contracted out to websites to do the posting. It is definitely a sort of side-income, but multiple types of side-income add up to primary income, so it’s still worth looking into. The rewards are given in the form of gift cards and the like. So this won’t be making you direct money, but it will offset some of the costs you may already have. Using this method will be another VERY small-earner. To me its waste of time, nonetheless, it’s a legit opportunity. The PTS (paid to surf) business model was more popular around the turn of the century than it is now, but there are still ways to get paid for it today. A website like paymentsurf.com will gladly pay you for surfing the web, or more specifically, by visiting their sponsor’s websites. The business model is mostly a circular way for businesses to drive traffic to their site. You can make around $10 in a day (that’s the cap limit,) usually for around an hour of work. The websites may ask you to buy into them to increase your earnings, but I would recommend that you simply make the money for surfing and leave it at that. Virtually everyone everywhere is using YouTube on a regular basis. Especially over the last few years, being a “YouTuber” has become a legitimate profession and one that earns money far and above a regular job if you can rise to prominence. The top 10 channels on YouTube make at least $20,000 a month, and that’s not even considering how much they are capable of making in merch sales, or under-the-table endorsement type deals. The phenomenon of “Let’s Play,” or videos of people playing video games while talking, has become massive and there are hundreds of thousands of people trying to break through on it. The website TwitchTV is also an example of the rising prevalence of Let’s Plays. It doesn’t matter if you’re playing video games, or music, or talking, as long as what you’re doing is interesting and people want to watch it. Let’s be clear, though: becoming a successful YouTuber requires work, luck, and diligence, so the idea of being a full-time video maker is more of an exception than a rule. However, if you can make a few videos and get some subscribers, it can be a great secondary source of income. There are websites looking for people to give feedback on products, usually before they are finalized. A site like SoftwareJudge will pay you to test software and then respond with a survey or written feedback about what you experienced. If you’re looking for something more in the way of beta testing, you can check out Erli Bird for beta testing jobs. Erli Bird is a website that asks you to record your session with software and then submit a written request. These beta tests can be for video games, apps, software, and other kinds of products. These things will usually offer something like $10 per opportunity, which isn’t bad considering it’s only 30 minutes or an hour of work. Well, this one is more of a method of mitigating loss than of making money, but it makes sense to take advantage of, as you’ll see. There are such things as GPT (get paid to) sites that will offer you money in return for taking advantage of opportunities that their sponsors offer. Surely, there are some GPT tasks that don’t require any purchase, you might be asked to subscribe to a newsletter or provide your traffic to a website. But you also might be asked to do something like try a trial of a service or purchase a month of something, and in that case, you’ll need to put money towards the task. The GPT site will reimburse you in whatever form they compensate through. This is a good method for something like getting a Netflix account. If you’re going to get one, and don’t have one, you might as well find a GPT site that gives you cash back for it, and recoup a little bit of the cost by taking advantage of it. Now, there are two ways to get money for installing software and they’re totally different. The one you’re most likely to find opportunities for is a form of affiliate marketing, where you post the download link to the software on your website and get paid per person who installs it. If you happen to come across anybody who needs this service, just charge less than the Geek Squad, and you’ll still be able to make good money for very little work. Are you a gamer, perchance? If you are, there is a way to make money, and good money at that, that is exclusive to just you! There is a fortune to be made selling virtual properties. If you’ve ever heard of the online game Second Life, it’s something that people get incredibly invested in and treat as, well, a second life. Ansche Chung is probably the most famous person to have ever benefited from this method, who became a millionaire by repeatedly selling land and houses on Second Life! Yes, a millionaire from playing games, and that’s no joke. People have also been known to do this for characters on World of Warcraft and can make upwards of a few hundred thousand a year. It’s important to note these people created their own whole system for maximizing their ability to produce high-level characters/worthwhile properties. There is a market for it, though, and if you’re good with systems and repetitive tasks, this is something you can accomplish. Lots of people have become online entrepreneurs by hosting their sales business on a hub website, like Etsy. If you have the ability to produce some type of tangible good, like clothes, accessories, art, then you can run a virtual storefront, too. This is just a way to organize a business without having to start your own website, essentially. After setting up the storefront and producing the products you’re going to sell, all you have to do is drive traffic on over to it and make sure you keep a good relationship with your customers. This is just classic business in virtual form. Now, this is admittedly a bit of a tight-lipped service, so I can’t tell you the exact ins and outs of it all. But there does exist a whole market out there where you can get paid to upload files to file sharing services, and you’ll get paid either per upload or per download. The payout is usually $1 per down/upload, but some sites advertise the possibility of $5-$20 per. It’s hard to talk too much about it, because there is the possibility that the files that are uploaded and shared might be breaching some sort of copyright, and that’s some dicey stuff to get into. But if you’re willing to look into it, you can find plenty of resources to read about it online. In our rising global culture, there is more need than ever to have documents translated from one language to another. This isn’t just limited to documents, of course; people are going to want audio, video, and even images to be translated. If you are bilingual (the more languages you speak, the better) there is a wealth of work available for you online. Freelancing sites like oDesk regularly see this type of work advertised, but Gengo is a website that specializes in employing translators. Your abilities of translation are valuable, so don’t be afraid to look around! Once you build up some skills and experience, you can charge a pretty fair wage for this service. So there’s the list of opportunities that can be done mostly or exclusively online. But if you’re not into that form of work, rejoice! We’ve got plenty more options for you listed below on ways that can help you earn money around town. There’s a pretty fair chance you’ve never heard of ghost shopping. Ghost shopping is a service that people seek out when they’re low on time but have cash to spare. It means that someone will send you out to do their shopping for them, and then you will deliver it to them in return for a small fee. Now, a Google search for this term offers some confusion because it mostly lists “mystery shopping,” which is a different service we will discuss below. And if you run it as a business, the legitimacy will make people more comfortable sending you out into the world with their money. If you have any kind of “entertainer’s” skill, you can definitely make some money doing it on the street. In fact, guitar players who play in heavily foot-trafficked sections of the city during peak hours have been known to make up to 2 or 3 thousand in a day! Of course, that’s not what you should be expecting to make, but it gives you an idea of how the money can add up. On the other hand, you need to be careful of your local ordinance and the laws about street performance, in a lot of places you’ll need to buy a permit from city hall. If you aren’t having any luck with it, try the next town over. The truth of the matter is just that some towns have a different reception to it than others. Amazingly, walking dogs for people can actually be a full-time job. Obviously, it helps if you are an animal lover. , If you charge a fair rate per dog, $10 or so, and you stack up 7 or so customers in a day, then now you’re looking at some actual job wages. Seasoned dog walkers stack up multiple sets of dogs a day, and walk multiple batches. It’ll require a little bit of handling skill on your part, but it’s a real way to get money out of such a simple task. Consider asking your customers if they are alright with their dogs being walked alongside other dogs, just in case they have any strong feelings on the matter. You may have never looked for stock photos online, but if you have, you certainly noticed that the prices are quite steep. There is a serious cost involved with using stock photos for commercial purposes, but if you’re doing business, there’s no way around it. You can be the person who’s taking and selling those stock photos, and you’ll get a commission each time one of them is downloaded. Other sites will pay you a flat fee for the photo itself. There is one rule of thumb: the rates for either option aren’t great, so you’ll be wanting to take a lot of pictures. Stock photos are of a studio-quality almost by definition, so this is mostly an option for people who are already photographers or know a photographer. Yes, this one is as straightforward as they come! If you need money, the simplest way to get it is to sell something. There are lots of ways to do it, classified ads, Craigslist, eBay, etc. Notice that we consider this a distinct option from pawni because pawning implies that you may come back for it when money is less tight. We’ll discuss that below. When you sell something, you should always look around for prices that people charge for similar items. You’re going to have a hard time selling that DVD player for $50 bucks if there is a $10 one online. Always price according to demand. If you are selling something you consider really rare or valuable, do the research and consider selling it through a specialty site. Antiques, for example, should be sold to antique-lovers specifically. Anyone else won’t value it as highly. There is something of a stigma against pawning in today’s world. And it’s true that nobody wants to part with the things they hold dear, but pawning certainly isn’t all bad. In its basic form, pawning is just receiving a loan where you provide your possessions for liability. There is interest on the loan, of course, but it is also a loan that you can get on-demand without any messing about with credit history or things of that nature. In my singular experience with pawning, the clerks were sincere, honest, and very clear about what the terms were. It doesn’t have to be as bad as it seems, and if you’re in need of the money it’s really a decent and civil option. If your financial woes are temporary, you can always come back for it, after all. At the risk of sounding callous, being paid to donate sperm seems like something you’d get people lining up around the block for! That’s true in a sense, because sperm donors have a very stringent selection process, and only 7% of applicants or so are selected. They’ll be examining your family’s medical history, your medical history, your lifestyle, and anything else you could think of that might affect the quality of your sperm. The donation is on their terms, and your viability to donate is at all times tentative. You can make around $40 per donation. For the ladies, you have a much more difficult but much more rewarding option – donating your eggs. Donating eggs is not nearly as pleasant of a process as donating sperm, and will require a harsh drug regimen and testing for 3 to 5 weeks. It will be a significant undertaking. However, it has the higher reward – An egg donor can easily expect to make $3000 or so from a donation. There have been stories of people who were searching for the “perfect” egg donor and were prepared to make audacious demands, like that the donor be a valedictorian! However, in these cases, the donors have been reported to make $50,000-$200,000. Nobody’s going to pay that much for sperm, that’s for sure! OK, I know what you’re thinking. That sounds crazy, right? I might as well tell you to win the lottery. Well, getting onto a game show isn’t as crazy as it seems. Only certain people will apply to be on a game show. You’ll have to be comfortable being on camera, for one, and be willing to get to a studio and be there for 12 or more hours, maybe even staking out overnight if the applicants are decided by who arrives when. If you’re the brainy type, apply to be on Jeopardy and see if you can pass the applications. If you’re better at guessing, consider the Price Is Right, or maybe Family Feud. It’ll depend on where you are and where it is filmed, but if you can spare the money to catch a plane, you can apply to any of them. This option is far more grounded and realistic if you give it an honest try and are diligent about it. The difference in this and walking dogs is that walking the dogs is an active task which requires more energy but is over more quickly. Pet sitting is a more passive sort of task, but it is also something that requires more time, often occurring overnight or across a series of days. If you’re interested in this option, DogVacay.com will allow you to make a profile, set a rate, and advertise to people in the area. It’s best to pitch yourself as someone who is familiar with and fond of animals because these people obviously care a lot about their pets. Most people will prefer to have someone watch their pet who has a yard of their own. 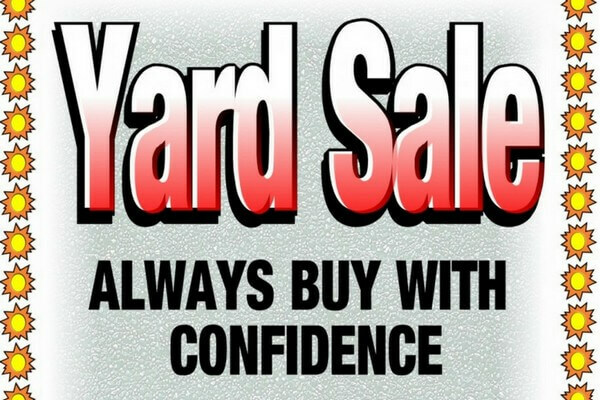 A garage sale is technically the same as selling your stuff, like listed above, but has a strictly lower price point. The thing about a garage sale is that items are priced to move. You’re not trying to recoup a solid 50%-75% of your original cost, think more like 15% or less. It’s more important to sell something for a low cost than not at all, as far as a garage sale. If you have something you’re trying to catch a high price for, sell it online instead. Another classic, but equally valid as all the options here. Western nations are very fond of their yards and lawns, so you have a high rate of potential customers concerning this. You can get your foot in the door by figuring out the local rates and undercutting them. After all, the gardening companies in your area are also trying to pay the owner and the administrative costs in addition to the employees. If you come in offering the service for half of that, then you can easily score some business and keep a tidy profit. Offer pruning and trimming services for the other foliage around the house if you want to make a little extra, but make sure you’re capable of doing it well! Remember up above when we talked about ghost shopping? Well, here’s the form of paid shopping that people are more familiar with. A mystery shopper is hired by a customer to go to an establishment and interact like a normal customer, except when you leave you’ll be giving a report on the state of the establishment, the behavior of the employees, and the quality of the service that you received. You will often be paid a rate in return, and some businesses will cover the cost of the shopping you had to do while there. A quick Google search will direct you to a few companies that hire mystery shoppers. There is a high demand for people who can attend theaters, and your demographic information will be important. This is a seasonal, regionally dependent version of the lawn care option up above. If you live in a part of the country where it snows, you already know that having snow on your sidewalks, driveways, and lawns can be a huge pain. Most people don’t want to wake up early to clear it all out of the way, and that’s where you come in. Depending on how quickly you can work, charging $10-$20 a yard can be a great boon to you. A larger yard will justify a higher rate. If you get really into it, you can invest in a snow blower and greatly increase the rate at which you can work, which will allow you to take more customers and, in turn, make more money. These same rules apply to raking leaves. If you’re raking leaves, you can also bring a ladder and offer an extra gutter cleaning service. Just be careful while you’re up there, self-employment has no workman’s comp! Not technically limited to “twirling,” you’ve definitely seen someone around town standing with an arrow-shaped sign, indicating a nearby business. It’s a favored profession of the youth and the elderly alike and can pay you minimum wage or maybe even a little above. Some people make it extra easy on themselves by having stands that hold the sign, and they just wobble them about, and others get very into it and learn to do dances and tricks. Either way, you’ll be making the $10 an hour, though you may have to wear a silly costume. It is said that the more enthusiastic twirlers will receive bonuses, though! Clinics of dental and medical varieties are constantly looking for people to participate in their studies and tests, and you can be compensated for being one of those people. Generally, you’ll have to sign a release form accepting the consequences of the trial itself, so this is a task for those who are not afraid of that possibility. Hospitals and universities are also a good place to seek out this type of money-making opportunity. For a detailed article on this topic that includes a list of places you can go to participate, read making money as a human guinea pig. Yes, another basic sort of option. The thing is about these basic tasks is that they’re timeless; people have needed these services since the beginning of civilization, and they’ll need it in the future, too. Nothing is more basic than the need to eat, so you can easily find a way to get paid for the simple task of cooking good meals. It’s a given that this is really only an option if you can cook well, of course. Securing this type of arrangement is mostly a matter of branding. More people would be willing to hire a personal chef than you think, so long as you sell it to them properly. Advertise that you are capable of cooking fresh, healthy meals and that you will purchase the necessary ingredients right before you come over to cook. Ask your potential customer to compare the cost of your services to the cost of eating out, per night. They might find that you are capable of producing a higher quality of meal for a similar price. Furthermore, you could advertise different types of deals, like say a “leftover package” where you cook a large amount of an easily stored food so that they don’t have to have you come over every day. We’ve talked before about the possibility of running a virtual storefront. This is the grassroots version of that same option, really. If you make clothes, accessories, or even visual art, people can and will buy it if you get yourself out there. Find a way to get your name out there. A good option for this is to make some stuff for free for your friends and give it out. That could help you get the word out. Artists can be very insecure about exposing their work to the world, but if you want to make money, it’s best to just throw it out there and get some feedback. And no, we’re not talking about the people who hang off the side of skyscrapers! You can offer a window cleaning service for a low rate, and secure your business on a weekly or a monthly rate. The business might just tell their low-level employees to do the washing, but you can offer your services and free up their staff to do other things. After all, the windows are the customer’s view into the store itself, so we can’t scoff about the importance of a window washer. Lately, the services of Uber and Lyft have become very noteworthy. These services are revolutionizing the taxi industry, which was before a competitive sort of business that left workers and customers alike dissatisfied. All you do is install the ride sharing company’s app so you can get notified of people in your local area who need a ride. Rates will often be quite high since this is technically a personal ride service. There are drivers who are making a living with ride sharing, treating it as a full time job, and then there are those who use it as a way to make some extra cash on the weekend and whenever they have some free time. Either way, it’s an awesome way to make some money with something you already have, a car! Now I’m sure a majority of you are recoiling at the mere idea of it. Well, I completely understand your hesitation, dear reader, but I’m happy to inform you that dumpster diving isn’t all the negative that it seems like. There is a whole community of people who dumpster dive, and it plays in the “freegan” lifestyle. Google “Dumpster Diving Reddit” to be directed to a popular forum for people who participate in it. You’ll find that if you are willing to tolerate the unsavory idea of activity, there is really a lot of unnecessary waste in the world that the brave can benefit from. This includes food, furniture, and appliances. Too grossed out to even consider the idea? Well, just wait for when a retail store is closing and ask if you can have the stuff that is due to be thrown out. Retail laws mandate that they throw out food by a certain date, even if it’s perfectly good. A lot of people will be glad to give it to you, just knowing that the food isn’t going to be wasted. I’m putting both of these under the same heading since they’re the same basic concept. If you have a large storage space available to you, you can stockpile old tires and metal and eventually take them down to a recycling plant/scrap yard to pick up a little bit of cash. Hopefully, you’re not against donating blood just for the good of it, because blood saves lives! But if you’re afraid of needles or blood, maybe you could be swayed by knowing that there is some money to be made. Donating plasma could net you $50 easy, though you’ll be woozy afterward, so don’t drive yourself there! If you don’t know what plasma is, it’s the clear stuff that appears when you get a cut, and it’s very important for making many types of medicines. Contests can be daunting. The rewards seem so good! But the chance of winning is so low. I recommend a different approach. Enter EVERY contest you care even remotely about. A contest has low odds of being won, so why not increase your odds by entering them all? If you don’t want the prize, you can always sell it later. I once knew someone who kept several cellphones on them for those “10th caller” contests on the radio– they’d pull out all the phones and start calling all at once. That person, as you might imagine, made it to a lot of free concerts. If you’re willing to put yourself out there, and you have some time to kill, why not enter a few competitions? At worst, you participate and fail, and at best you win and get some prizes. It’s a win-win in my book, because participating in anything will give you more confidence to get out there and do it again. Do it five times, and now you’re looking at an increasingly healthy chance of success! Now on this one, I’m going to have to strongly recommend that you go in with some idea of what you’re doing. You can fudge some of the options on this list, admittedly, but a massage is a pretty intimate behavior. The whole goal is to relax your customer, and everybody’s different, so if you go in there and start karate-chopping a frail, gentle person, you’re looking at a good opportunity for losing some business. Now it doesn’t mean you have to have completed school for being a massage technician, but at least read up on it and maybe watch some videos and stuff. Definitely find a few people close to you and convince them to let you practice on them. If you aren’t good at it yet, don’t try to make money yet. Massaging is a life skill as much as it is a business skill, and you’ll find plenty of situations in your life where you’ll be glad you took the time to learn. If you do manage to get some customers, mood is important too. Soothing music, good scents (candles or incense if the customer is alright with it,) and comfortable furniture are all ideal. I’ve had massages at people’s home-run businesses, and I can attest that an amateur masseuse/masseur can be worth the money. Note: Please keep in mind that in most places, you need to have a license to operate a business like that. So make sure to do your research and abide by the law. This is a particularly good option if you have some kind of workman’s tools. A site like Rentything can help hook you up with people who are looking to rent the tools on a daily, weekly, or monthly basis. Furthermore, there are places that will allow you to rent your car out, if you’ve got the guts to try it out. You don’t have to stress completely, though: a peer-to-peer car rental service, like RelayRides, will have an insurance policy in place, in case of any unfortunate accidents involving your car. This seems as basic as some of the other staple options on this list, but it’s a service you see done less often. Most people don’t want to drive a dirty car, but between work and a personal life, it is one of those kinds of maintenance that just falls through the cracks. That’s where you come in. Offer to wash someone’s car for a fair rate. What’s a fair rate for this service? Well, first let’s ask how you wash a car. If you think a quick spray with the hose with maybe some dish soap scrubbed on is a car wash, you’d better think again. There are a lot of do’s and don’t of car washing. To name a few, to use soap specifically for washing cars, to rinse with water before washing, to avoid washing in the sun, and to dry by hand. If you’d like to pursue this possibility, consumerreports.org has a fantastic article about how to do the job right. Flipping is another one of those things that seems simple, but I could really write about it for a long time. Let’s just give the brief overview: you get things for cheap and sell them for more. It might be because you fixed them up (which is the usual way of doing things,) or it might just be that you’ve got a better idea about what it’s worth than the original owner did. A simple, but good way to get into flipping is to check the free section of your local Craigslist. If you’re lucky, you can grab some good stuff that people just don’t have room for anymore. Pick it up, and turn right around to sell it on the “for sale” section of that same Craigslist. It might sound a little immoral, but it really isn’t: the person who is giving it away for free actively made the decision, and chances are that they wanted it gone immediately and didn’t have the luxury of waiting. As the seller, you have the luxury of waiting, and that’s really the big difference. Flipping is a perfectly legitimate way of making money, and some people do it full time. If you have any skill in an academic subject, you can easily make some money tutoring. There are plenty of ways to go about it: if you’re a degree-holding graduate (or a qualifying undergraduate,) there are websites online that will accept your verification and attempt to match you up with students who need your services. Of course, there is also the basic form of tutoring: simply helping someone in your life with their academic work. It might be your cousin, or your best friend’s little sibling, but there are lots of people who need help with their studies, and if you’re there offering your services, they might be inclined to give up a little bit of money in return for their academic security. A few of the options above have touched on this possibility, but this is the recycling that’s as simple as it comes. Recycling facilities are a huge thing around most towns, nowadays. It incentivizes people to bring in recycling when it may have otherwise been tossed out or disregarded. And in turn, the recycling facility can take the materials and sell them, or reprocess them into something new. 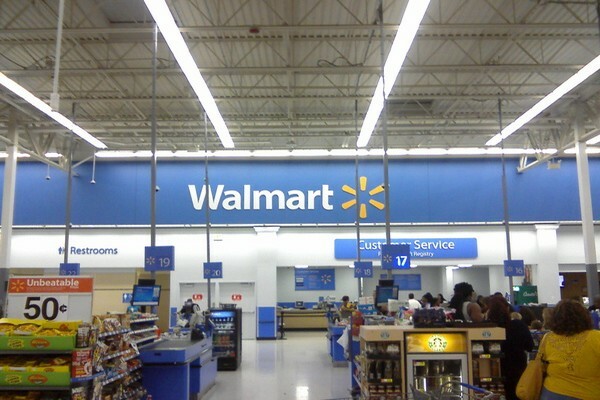 Using apps like TaskRabbit you can pick up a few dollars here and there while you are out and about. People who need small tasks done, post them on TaskRabbit and how much they are willing to pay for it. You can accept the task, do it and get paid. It’s as simple a that! Tasks include anything from picking up groceries and returning a book to the library, to visiting a nearby restaurant and taking a picture of its menu, to whatever else that needs to be done. There’s no doubt that maid services are prevalent in your town, thanks to companies like Molly Maid, who have a national grip on the house cleaning service. But the upside for you is that these services are not cheap by any means. I’ve hired maids to help me clean my house before, and I can tell you that you’ll be sinking a few hundred easy in whenever you hire one. The advice for this is the same as the others on the list, as far as preexisting businesses go: undercut their prices! The problem with national services like this is that they have to raise their prices the larger they get to cover their new costs of business. If you can convince a customer that you’re just as worthwhile and offer a better rate, then you’re going to have a good opportunity to secure a long-term customer. Consider offer an extra service, like organizing. Professional organizers do exist, but breaking into the field is no piece of cake. This could be a good way to get your foot in the door towards that path if you want it, but otherwise, it’s still not a bad gig to get paid for cleaning. You might consider this one the logical consequence of our previous option! Babysitting is an ages-old way to make money, favored by teenagers across the world. It’s easy money if you’re good with kids, but not so much if you don’t like them. The biggest barrier to entry with babysitting is simply that the market is saturated, and people are most likely to trust a teenage girl to babysit their kid than a grown man. However, if you want to get your foot in the door, you should always start with friends and family. There is also care.com, which is a babysitting hub where you can make a profile and set your rate. If you have an extra room in your house, you could be making good money by renting it to travelers. It’s as simple as using a site like AirBnB which makes it very safe and easy to rent a room to people. I didn’t want to include this one because to be honest most of us looking to make money with no job probably don’t have the money to buy properties as an investment. If you don’t have the money, these days there are a lot of creative easy you can get your hands on cash, from mortgaging your properties (not that I recommend it!) and getting a bank loan to investing in crowdfunded real estate companies and so on. That said, if you have the money or can somehow get a loan, investing in real estate is a great option. Flipping houses: Basically buying houses in bad shape, fixing them up and selling for a profit. Both of these require a lot of knowledge and time. I am sure you’ve seen those fixer-upper shows on HGTV once or twice. Unfortunately, they don’t tell you the whole story. There is a lot of efforts that go into making it a successful venture. And sadly, a lot of people fail. And even those who succeed, don’t succeed every time. That’s the part you never see on those shows. So while investing in real estate is a great way to make money without a job, there is a lot of risks involved. And technically you are working a job. Sure, you may not be clocking in and out in some factory or office, but you still have to hustle. That’s not the bad part though. To make money in any way, you still have to put in some sort of effort and time into it. The problem is that this isn’t a free way. You risk losing a lot of money. So please, if you are considering real estate investment as a strategy to earn a living so you don’t have to work a boring job on an assembly line at some factory or deal with paperwork and phone calls all day long at some office, take your time to learn about the process and what’s involved in investing in real estate. If you can’t afford to lose the money that you are going to use to buy the property, don’t do it. Now, how’s that for a list of ways to make money without having a traditional job? No matter who you are, there’s almost certainly something here for you. Unless you’re intentionally trying not to get an official job, there’s a good chance that some of these might lead to more long term employment. There’s also the added benefit of any type of entrepreneurial endeavor: your wages aren’t fixed. That can be good or bad, but when it’s good, it’s really good. Some people would rather make a guaranteed $100 in a day, but some people would rather take the gamble on making $50 or $150 in a day. Regardless of which type you are, the options on this list could lead to either. We like your list a few we have tried and others are viable options to make more money! Thanks Robert. I am glad you’ve found a few new tips. Your mock trial idea here is intriguing, will definitely pursue that! It is indeed intriguing. Let me know how it goes. There are actually quite a few living in the US that make a really nice income working on Fiverr. $5 is just the base rate. I am a Fiverr seller and most of my gigs are upwards of $45. I easily get 15 to 25 orders a week. Also, I have so many returning clients. It’s rare to have a $5 order. There may be other international countries that work for $5 no matter the complexity of the order. I think it’s unfortunate. If you’re providing quality service and it takes time to make a great product, you should get paid accordingly. I agree 100%. $5 is indeed just the base rate. I actually have a few gigs on fiverr that start with a $5 base, but most people upgrade their orders and it can go as high as $45. Exactly right, I have been on many of the freelance sites for a few years now, and have yet to get one job. I have a formal American education in Communications, and I am also a webmaster with several sites, and products of my own. I find it disturbing that these third world countrties are taking all these jobs, especially India. These people have poor spelling, and bad grammar, yet they get the jobs because they work for pennies. Some of those freelance sites also charge a fee to “bid” on these jobs. That is just plain wrong. I usually can find jobs on my own, because Internet Marketing is not what it use to be. The competition is fierce, paid asdvertising yields little due to cost, and Google keeps changing the rules. Then there are payment thresholds, and buyers that request refunds after they download the product. I hate to be negative, but getting a “real” job is much easier, or just getting off the computer, and work from home, not at home. Another great resource. Thank you. If a person wants to make some extra cash, they really just need to capitalize on the laziness of others. Raking leaves, shoveling snow, cleaning gutters, picking up cans all excellent ways to make money by focusing on lazy. Regarding #12, Getting Paid for Expert Advice, the AllExperts site appears to be all volunteer only with no mention anywhere of being paid for any expert answer posted. I do however appreciate your post/blog of all these opportunities. Do you have an opinion regarding the site JustAnswer as a viable paid to answer site? Nelson, thanks for the heads up. It seems like AllExperts has changed the rules. The site indeed is using volunteers to answer the questions. They used to pay their experts for answers. I’ll update the post. Thanks again. As for JustAnswer, I use it myself and I do make money. That said, I wouldn’t count on this kind of sites as a way to make a living. But they are great for extra cash in your spare time. I definitely identify with not being one of those who get an assured $100 daily in favor of the chance to make $50 or $150 on different days. I’m not against being employed but I love being entrepreneurial. Thanks for the feedback, Samuel. Thanks. Great article. I will be trying some of your suggestions. You are welcome, Brenda. I am glad you find it helpful. Which ones in particular are you interested in trying? Great stuff. Tried a few of these already myself, and they’re reliable. Thanks! Thanks for the heads up, Elyse. Are the process and rewards about the same? Love the article, thank you very much! Definitely want to try out Fiverr and writing some e-books. Only problem I found is, I live in Australia so a lot of the websites you mentioned aren’t exactly useable to me. Other than that, I’m excited to try out some things. Thanks again :)! Thanks for the kind words, Jesse. I am glad this post is being helpful to you and others. I really do hope you do get on with ebook. I always encourage people to do it. The fact is each of us have some kind of expertise or knowledge that could be useful to others. And the good thing about ebooks and Kindle books is that they don’t have to be a thousand page long. They can be just a few pages, as long as they deliver the message, they are good. Anyway, I wish you good luck. I’d be happy to hear about your progress as you go on. So feel free to comment here or contact me through our contact page if you have any question or need help with getting things going. As for sites not being available for Australians, you can normally find the Australian version of them easily. Thanks for the reply! I haven’t been able to check out any of the websites yet, due to being a little busy. I’ll let you know on my progress when I do get the chance! In regards to the Australian sites, I’ll try my best to find them. Thanks again! You are very welcome, Jesse. Sure, life is busy and hectic for all of us these days. Hopefully you’ll find the time soon to do it. I’ll keep an eye out for Australian specific sites and will let you know if I find any. On that same note, do you have a Canadian list or know which ones do not work in Canada? Mimi, most sites that accept Americans, also accept Canadians. I’ve been looking lots into blogging and ebooks lately, any tips on them specific areas? It’s hard finding ideas for an ebook. But I’ve heard stories of people making a living off of them, with fairly simple ebooks. Jesse, yes there are people who make a living selling eBooks, but the process is anything but easy. Sure, you can write simple eBooks and people will buy them. After all, what may be simple and obvious to you, is not always obvious to other folks. So my advice is to go with subjects you are knowledgeable about. Pick something you are good at and share it with others. Now writing an eBook is the easy part, promoting it is the hard part. That said, Amazon Kindle has made it much easier to promote your eBooks. So I would suggest you write your eBook in kindle format and publish it on Amazon Kindle. They have a few free programs that help you promote the book as well. Start from there and learn as you go. It’s the best way. Good luck. As the Librarian for the entire massage profession, I must profess my dismay at item #51. In most states, therapists are required to be licensed to practice, and in some of those states, they are also healthcare practitioners. If you want to violate state and federal laws in the United States, or endanger clients, please, feel free to poke your hands and fingers into contra-indicated areas of the body. Don’t know what contra-indicated means or which areas require care? Kenneth, you seem to miss the point of this list. We didn’t put these items on the list and suggest that every single person try every single item on this list. Of course you are going to have to check with your state laws if you are doing any kind of business, including massage therapy. Cathy, most of the sites mentioned in this list are for extra income. You can’t earn a full time living. Although there are a few that can and will earn you money than a day job ever could, like freelancing and blogging. And yes, you can do almost all of the options mentioned here from home. And the best part is that you can work whenever you want. I agree with Kenneth. I’m a massage therapist, and it is against the law in my state to accept money for massage if you are not licensed. You can’t just announce that you will give massages for x amount of cash, and be legal. And believe me, law enforcement checks. Again, we didn’t put the items on this list thinking that every single person has to try every one of these. It’s juts a list of ideas and possibilities for people with different skills and expertise. And as always, before starting any business, it’s a must to check your local laws and regulations to ensure you are operating within those laws. Thanks for chiming in, Jeanie. Hello Jesse how you doing? Thanks for chiming in, Sid. Yes they are. They just are different and take a different kind of skills. You have to have the willingness and drive to take risks and do things that others think “are not realistic”. That’s how entrepreneurs make million dollar companies out of seemingly stupid ideas that other people dismiss. I personally have made money with many of these methods, and I know many others who have done the same. Fluctuating from fact to fact; same as in between different individuals. Agreed, these ”professional” types who are already established either have no idea and never has or they forget what it’s like for the real ”average joe” which 99% of the time no matter how much they want to be, they are not one of us! P.S. I am not affiliated with WGU, I just have friends who work at home for them and they love it! Awesome addition, Karen. Thanks very much for sharing the link. I don’t know of any specif sites catering to the Caribbeans. But if you want to make decent money, you may want to try freelancing (writing, design, etc). Freelancing sites don’t care where you live as long as you do a good job. Wow, I haven’t heard of the mock trial idea. Sounds really interesting, this list is great! Will definitely look these things up. I am glad you found something new, Alison. Thanks for the kind words. Hello, The mentioned survey sites pay with rewards. I was wondering which pay cash. I’m not looking to make big bucks just an extra $100 a month if possible. Just a couple of thoughts (love the stuff you have on here–I do some already and will investigate a few others). First, in addition to pet sitting in your home, you can house sit with or without pets. In fact, if you have good enough references, you can get jobs in places where you want to visit and have a housing-free vacation. Since you’re watering the plants, bringing in the mail, and keeping the house safer by being occupied, you can charge more than pet sitting in your own home. Also, if you live in an area that has high end boutiques and/or resorts AND if you make hand crafted items, see if the two of you are a good match. I live in a tiny town in Ecuador so that doesn’t work so well for me but I still sell my wares locally. I certainly couldn’t make a living at it but while I’m house sitting and have time to listen to audio books, I crochet things and sell them. The two of those things bought me a tiny house full of custom-made furniture in a little over a year. Thanks for the list–you did a fabulous job of pulling tons of stuff together. Awsome tips, Cynthia. Thanks very much for taking time to share it with us. I’m sure a lot of our readers will benefit from it. Thank you for sharing the Virtual World “real estate” venue. I have been in Second Life for 10 years. There are people who do sell land/etc. However, there is another part that you may make mention of, which is “creation”. There are people who create textures (which is also another work-at-home opportunity…graphics design), there are others who create items called “scuplties” or “mesh” which is a building block to making items in second life…and then there are people who who use said items to create items in Second Life…houses, furniture, vehicles, animals…a lot of items to enrich people’s virtual life. Many people have made extra income from it…from just enough to buy their virtual outfits/skin/appearance, to paying for their virtual living needs (land tier and purchase, etc), to actually pulling Real Life dollars from the game…I even know of many who made their living from it (and one person who died in real life, and her friend stepped in, and now runs her business, with the money going to support the deceased player’s children). Thank you for including this version of money making, and thank you for sharing all of the opportunities. I am disabled and unemployed right now, so this will be a good list for me to look at! Thank you very much for taking time to let us know about the “creation” part of Second Life. That is very interesting. Wow, that’s amazing that you know someone who actually makes a living on Second Life. I am sorry about your disability and I am very glad that this site is being useful in you helping you find new ways to earn a little extra income here and there. Selling characters, aquipment and gold is against Blizzard’s terms of service last time I checked. You can get your account banned from the game for that mess. Not that it stops the gold/ character selling. Everything was great on here except the massaging people, at least if you are thinking about making a home business out of it. It is against federal law to have a massage clinic (or practice) with out a license and if you are not reporting taxes. If you are just massaging family and friends, I guess that could be fine, but there’s always a risk of injury if you don’t exactly know what you are doing. You are absolutely correct, Liz. Thanks for reminding us about that. I went ahead and updated the post with the point you just made. Thank you. Some of these are some weird ways to make money without a job. Like a lawsuit. Great Article. Long but interesting. Thanks for sharing it. You can totally drive yourself to donate plasma. If you feel woozy after donating, the nurses monitor you until you’re feeling better. The key is to drink tons of water the day before and day of donating. This list is awesome! A ton of things I am going to try! Thanks, Annable. Glad you liked it. Your advice for participating in a class-action lawsuit when you have never used the product is dishonest and unethical. The advice for trying massage therapy is dangerous (you could really injure someone if you don’t know what you are doing) and in most states is illegal. Sandy, please point me to where we suggested that you should apply for class action law suits even if you haven’t used the product. As for massage therapy, that’s why we mentioned you need a licence. Just because a job is dangerous, we shouldn’t mention it? And what job isn’t dangerous on some level? Really big on the blogging bit. But I am impartial ;) Super list! I know you are, Ryan! I do read BloggingFromParadise from time to time. Awesome work you are doing. And thanks for taking the time to comment. I started my own cleaning business. Pt at first while I worked my day job. After one year I more than doubled my income doing the cleaning business so I left my day job. I was make $150,000 a year within 3 years and had 4 part time employees. That worked out very well for me. I did commercial and post construction. That’s fantastic, Helen! Thanks for sharing your success story with us!! Great question, Mathews. In regards to there being a cap, you can only visit 200 sites a day. As far as upgrading, I’d say no, I wouldn’t pay to upgrade. As I mentioned in the post, I think paid to surf sites are a waste of your time. There are far better ways you can make extra money online using that time. The only reason I listed it is because it is a legitimate site and way to make a few cents and I know our readers like a wide range of options when it comes to earning extra money. Hope that helped. Let me know if you have any other question, Mathews. I must say great article. A lot of interesting things to do but unfortunately not for me. This tips will not be well used in Europe. Sometimes I am really sad to live out of America. Good luck. Thanks for the comment, Garbriela. While some of the items on the list may be easier to complete in the U.S. (taking surveys), there are many others that can be done anywhere. Taking stock photos, dog walking, starting a blog, running a virtual storefront, etc. You can make money doing most of the things on this list in Europe! Thank you for sharing, and I hope you will keep us updated on your success!